Leipzig (GER), 20 January 2013 – Germany’s Christian Ahlmann showed exactly why he holds No. 1 position on the Jumping World Rankings when trouncing the opposition in the ninth leg of the Rolex FEI World Cup Jumping Western European League series at Leipzig, Germany today. In the ten-horse jump-off against the clock he was in a class of his own with the brilliant Taloubet Z who set an unbeatable target when sixth to go. And it was a spectacular hat-trick for the partnership who took the Rolex title at the 2011 Final and also won last year’s qualifier at this same venue. Runner-up was Ireland’s Denis Lynch with the big gelding, Abbervail van het Dingeshof, while Olympic individual silver medallists, The Netherlands’ Gerco Schroder and London, finished third. On an afternoon when many of the top riders were further testing some newer horses in their strings, it was Switzerland’s Pius Schwizer who slotted into fourth ahead of Australia’s Edwina Tops-Alexander and Ego van Orti in fifth place. A total of 40 horse-and-rider combinations contested this class, and it was always going to be a tough one to win as the starting line-up included nine of the top ten in the World Rankings. With the series now moving towards the closing stages, and with just three further qualifiers to go, the battle for a qualifying spot at the Final in Gothenburg, Sweden in April is intensifying with every round. And course designer, Germany’s Frank Rothenburger, tested them with a track that demanded rider skills all the way to the final fence. Pathfinder Olivier Philippaerts from Belgium made it look deceptively easy when returning with just a single error at the penultimate oxer in the opening round, but that was more of a reflection of his growing partnership with Cabrio van de Heffinck than an indication of the difficulty of the track. The challenge lay in the placement of the fences, with sharply angled turns to many of them, and the time-allowed which punished two of the nicest rounds of the afternoon -from Malin Baryard-Johnsson with H&M Tornesch and Germany’s Meredith Michaels-Beerbaum and Bella Donna – who each returned with a single time penalty. As a testament to Rothenberger’s design skills, every fence on the course fell at some stage in the competition, but it was the triple combination at fence five and the following double of oxers that saw most of the action. The wide spread on the oxer at fence 5b ensured that accuracy was required on the approach, and this fence accounted for two of the three non-finishers in the first round, Great Britain’s Guy Williams, and the man who has been leading the Western European League rankings throughout much of this season, Spain’s Sergio Moya, both running into trouble at the final element here before calling it a day with Titus and Zipper respectively. Italy’s Luca Moneta also retired when Neptune Brecourt was clearly way off form. Ahlmann already had the look of a winner when cruising around the first track with incredible ease. Taloubet Z was crisp and clean in his jumping, and made it all look very elementary indeed. The ever-consistent Jens Fredricson and Lunatic led the way over the jump-off course that began at the second of the oxers at fence six. From there it was on to the Rolex vertical at eight and a gallop before the turn-back to another vertical at fence three. This would prove pivotal in every sense. There was now a seven-stride distance from the oxer at fence four as the first element of the triple combination at five was removed, and then another swing-back to the water-tray vertical at eleven followed by a long gallop down to the final oxer at fence twelve. Fredricson made it all the way to the vertical third element of the former triple combination before faulting there, but The Netherlands’ Maikel van der Vleuten was only one fence from home when VDL Groep Verdi hit that. And when Portugal’s Luciana Diniz and Lennox left two on the floor it was still a wide open competition. Australia’s Edwina Alexander, winner with the veteran Itot du Chateau at the sixth leg of the series in Geneva, Switzerland in December, was partnering a new ride, the nine year old Ego Van Orti, and produced the first clear against the clock with a careful round that broke the beam in 41.21 seconds. Switzerland’s Pius Schwizer followed suit, but a little faster, when crossing the line with his new ride Picsou de Chene in 40.56, but it looked as if there was room for improvement on his new target time. Ahlmann showed that there certainly was, making a breath-taking turn to fence three that gave Taloubet Z only two strides on approach. But the stallion never looked under the slightest pressure as he shaved off more valuable fractions of seconds with an angled approach to the penultimate vertical to stop the clock on 36.45 seconds and really put it up to the remaining four. Marc Houtzager and Tamino Z, winners at Olympia in London just before Christmas, had two down when next to go, and while Ireland’s Denis Lynch and Abbervail van het Dingeshof were foot-perfect, they were more than two seconds off the pace when slotting into second with two more still to run. Dutchman Gerco Schroder was also clear but a little cautious when posting a time of 39.53 seconds with his Olympic silver medal winning ride London. But, last into the ring, Frenchman Kevin Staut had his foot to the floor as he set off with Silvana HDC. The mare showed an amazing turn-of-foot when crushing the opposition in the thrilling fifth leg at Stuttgart, Germany in November and was giving it her best shot once again. But Staut took a wide swing to the turn-back at fence 3 and, arriving on an impossible distance; Silvana reached out and paddled through the poles before dislodging her jockey who landed on his feet. It was all over, and the 9,000 spectators roared with delight as Ahlmann was confirmed the winner. This was no ordinary win, it was the most convincing demonstration of strength and the perfect way for Taloubet Z to end his winter season. He now goes to stud for a few months, before returning to work later in the spring. “For sure, he was in great shape today; he was amazing in the first round,” Ahlmann said of his horse. “He gave me such a super feeling, so I tried to take all the risks in the jump-off because of that. In Mechelen we were placed (10th) and I took him to Basel last week but we had a bad Grand Prix so it is great to finish the season in such good shape!” he added. 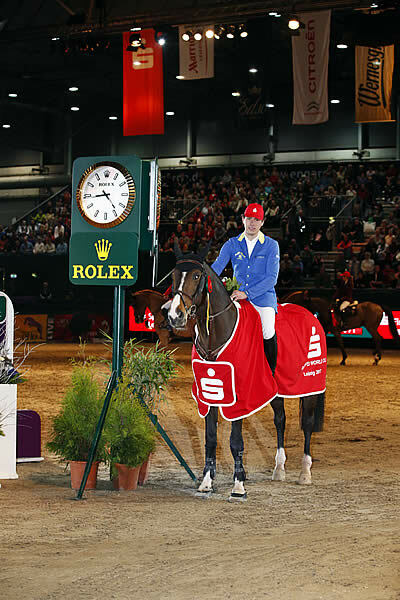 Talking about Taloubet’s extraordinary record of success at this show in Leipzig, Ahlmann said, “It’s a super, super show; everything is perfect for the riders and the horses and Taloubet always goes unbelievably well here!” The German rider plans to compete at Zurich next Sunday. “I will probably ride Codex there,” he pointed out, but he is unsure what horse he will take to the Rolex FEI World Cup Jumping Final in Gothenburg, Sweden in April. “Maybe Taloubet will be ready again; who knows, we will wait and see!” he concluded. For further information on the ninth leg of the Rolex FEI World Cup Jumping series at Leipzig, Germany, go to website http://www.partner-pferd.de or contact Press Officer Andreas Kerstan, Email andreas.kerstan@comtainment.de, Tel +49 177 75 32 624. The next leg takes place in Zurich, Switzerland on Sunday 27 January. For details of the Swiss event, check out website www.mercedes-csi.ch or contact Press Officer Roman Gasser Email roman.gasser@carre.ch Tel +41 79 635 50 05. Result: 1, Taloubet Z (Christian Ahlmann) GER 0/0 35.45; 2, Abbervail van het Dingeshof (Denis Lynch) IRL 0/0 38.65; 3, London (Gerco Schroder) NED 0/0 39.53; 4, Picsou du Chene (Pius Schwizer) SUI 0/0 40.56; 5, Ego van Orti (Edwina Tops-Alexander) AUS 0/0 41.21; 6, Lunatic (Jens Fredricson) SWE 0/4 38.48; 7, VDL Groep Verdi (Maikel van der Vleuten) NED 0/4 39.29; 8, Sterrehof’s Tamino (Marc Houtzager) NED 0/8 38.92; 9, Lennox (Luciana Diniz) POR 0/8 40.34; 10, Silvana HDC (Kevin Staut) FRA 0/Elim. Full result here. 40 starters from 12 nations. 10 qualified for second-round jump-off against the clock. 2 riders failed to make the cut when picking up just a single time fault in the first round – Sweden’s Malin Baryard-Johnsson with H&M Tornesch and Germany’s Meredith Michaels-Beerbaum with Bella Donna. 12 horse-and-rider combinations collected four faults in round one. 14 competing for the host country of Germany. 3 Dutch riders qualified for the jump-off. Course designer, Germany’s Frank Rothenberger. The oldest horse in today’s competition was the 16 year old Plot Blue, competed by Germany’s Marcus Ehning. Just three further qualifiers remain in the Rolex FEI World Cup Jumping Western European League series, at Zurich, Switzerland next Sunday 27 January, at Bordeaux, France on Saturday 9 February and at ‘s-Hertogenbosch, The Netherlands on Sunday 17 March. The Rolex FEI World Cup Jumping 2012/2013 Final takes place in Gothenburg, Sweden 24-28 April 2013.